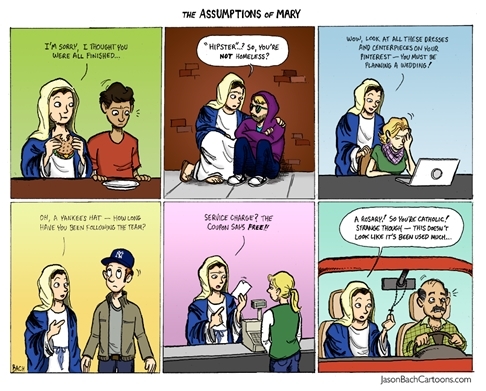 As the Catholic Church ends the Octave of the Assumption by commemorating the Memorial of the Queenship of the Virgin Mary, it seems apropos to end the Octave with a smile about "Mistaken Assumptions". For me, this year's celebration of the Solemnity of the Assumption was special. Not for the liturgy in a handspun parish in the "Wild and Wonderful" state. Preparing for the Holy Day of Obligation sparked some "Reconsidering the Assumption". The Orthodox traditions on the Dormition of the Theotokis enhanced my appreciation of the Solemnity reflecting Christ's resurrection. Taylor Marshall's reflections gives context on the Queenship of Mary and power over Purgatory. Bishop Venerable Fulton Sheen believed that the very foundation of humor is the ability to "see through things." While Jason Bach's cartoon brought a smile to my face, it helped me see through humor a better understanding the the Assumption.